Continued deadly heatwave in Spain is smashing all July heat records as Cordoba registered a high of 47 deg C 117 deg F.
The heat has destroyed crops in southern Spain where crops where destroyed by record cold in the winter causing shortages in European supermarkets. Spain baked in a record-breaking heatwave on Thursday which was blamed for the death of a road crew worker and is suspected of leaving another man in critical condition. The 54-year-old male victim died of suspected heatstroke late Wednesday while laying asphalt near the town of Moron de la Frontera in the southwestern province of Seville, emergency services said. 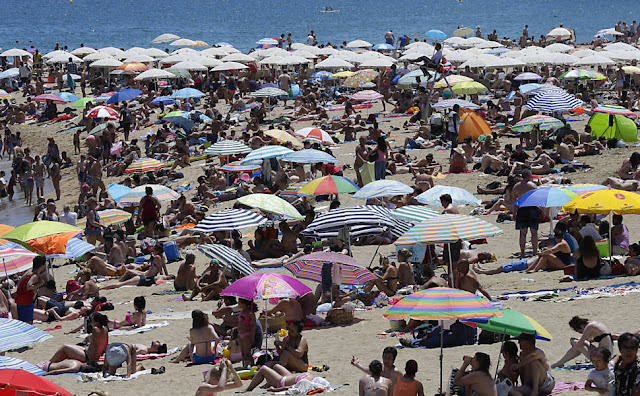 Temperatures reached 43 degrees Celsius (109 Fahrenheit) in Moron de la Frontera on Wednesday. Spain's largest union said it was investigating how long the man had been working and if the crew had taken special precautions because of the heat. A 50-year-old man is also critical in hospital after suffering heatstroke on Thursday while replacing pipes in Cabeza del Buey, a town in the southwestern province of Badajoz, local media reported. Spain's meteorological agency said seven cities including the capital Madrid set record temperatures for the month of July on Thursday. The heatwave - caused by a mass of hot air from North Africa will last until at least Sunday, officials say. Meanwhile in Italy wild fires have broken out around the volcano Mount Vesuvius as temperatures hit the mid 40's C and in Greece The Hellenic National Meteorological Service warns that temperatures are expected to escalate as high as 45C over the next few days as Greece witnesses the summer's continued heatwave.